Step 1 Place 1 tablespoon of the oil in a large cast-iron skillet; heat over high. Add chiles; cook, stirring occasionally, until slightly softened, about 5 minutes. Add corn; cook, stirring occasionally, until corn and chiles are charred and softened, about 10 minutes. Stir in 1/2 teaspoon of the salt and 1/4 teaspoon of the pepper. Transfer mixture to a plate; cover to keep warm. Wipe skillet clean. Step 2 Add remaining 1 tablespoon oil to skillet; return to high heat. Add shrimp and remaining 1/2 teaspoon each of salt and pepper; cook, stirring occasionally, until just opaque, about 3 minutes. Remove from heat; cover to keep warm. Step 3 Warm tortillas according to package directions. 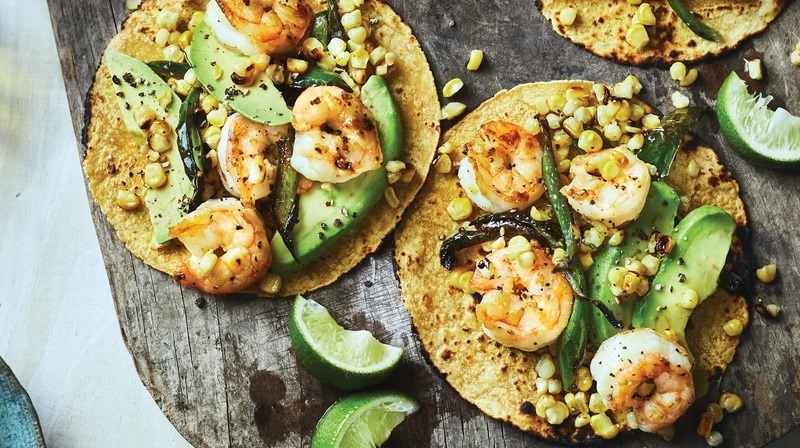 Divide shrimp, corn-chile mixture, and sliced avocado evenly among tortillas. Serve with lime wedges.